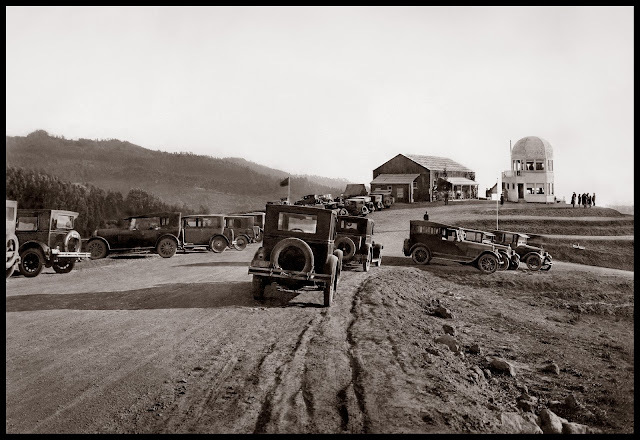 Crowd of prospective buyers arrive at the Real Estate sales office and observatory in Montclair Hills - 1923 (per license plate), possibly driving Chevrolet's made nearby in the automakers factory in East Oakland. Oakland made some many vehicles in the day that it was dubbed the "Detroit of the West", which was actually consider to be a good moniker. Sign on the building at the bluff proclaims, "Oakland, the Greatest City on the Pacific Coast - INVEST!" - indeed this is an overlook with sweeping panoramic views of Oakland, San Francisco and the Golden Gate. This is definitely not related to Chabot in any way. Prior to the Spanish Mission era, native Huchiun and Jalquin tribes of Ohlone Indians populated the general area. The Ohlone by tradition gathered nuts, seeds, roots and fruit, hunted small animals and fished local waterways and the bay. Later, the Mission system centered around Mission San Jose introduced Christianity, a lifestyle in farming, cattle raising, and unfortunately disease and other problems that led to the native inhabitants being largely eliminated. In the early 1800's - the hills here had great Redwood forests - among the tallest on Earth - up to 31' in diameter. The Redwoods were in fact so high they were depicted on the navigation maps of the time to aide ships entering the San Francisco Bay find their bearings. By around 1860 the first growth was gone, many brought down what is not Park Ave to the wharves in the vicinity of 14th, and use to build San Francisco - many via the first steam saw mill owned by a pioneer named Thorn - hence the name "Thornhill"
In 1820, Montclair and Dimond Canyon were part of the land from El Cerrito to San Leandro, which was granted to Luis Maria Peralta. In 1842, Peralta divided his land among his sons and the San Antonio section including Montclair and Dimond Canyon went to his son Antonio Maria Peralta. Prior to modern development, Montclair was geographically demarcated by two creek valleys, one on the northwest, and one on the southeast end of the Hayward Fault rift. The upper reaches of Temescal Creek ran through the northwest valley, and remains visible above ground today in the upper sections along Thornhill and Pinehaven Roads. The creek has two branches that join at the intersection of Thornhill and Pinehaven. From there, the creek flows down then south side Thornhill Dr. until Thornhill Elementary School were it then undergrounds. Then it flows underground down the remainder of Thornhilll and then down Mountain Blvd. to Broadway Terrace, before draining into Lake Temescal. In the northern creek valley, Thornhill Road dates back to some of the earliest development history of Montclair. This was an old 19th century logging road built by and named after Hiram Thorn. Thorn's road brought redwood logs to Oakland out of the vast forest known as the Moraga Redwoods, where he ran a lumber mill at Pinehurst Road near Huckleberry Botanic Regional Preserve, west of the community of Canyon. Thornhill later became a toll road to Contra Costa County. On the southeast end of Montclair, the north fork of Sausal Creek (also called Shepherd Creek) runs down Shepherd Canyon. At the freeway, near the parking lot of the Montclair Golf Course, the north fork of Sausal Creek has its confluence with the south fork (also called Palo Seco Creek) running from the eastern hills (encompassing Joaquin Miller Park). The creek then runs down through Dimond Canyon and across the flatlands (mostly in culverts) to San Francisco Bay. From Shepherd Canyon extending toward the southeast, the Bayside hills were covered in a vast redwood forest known as the San Antonio Redwoods. Around 1847, Europeans started logging the San Antonio redwood forest. In 1850, the area's first steam sawmill was built on the edge of Montclair, at Palo Seco Creek in the head of Dimond Canyon . 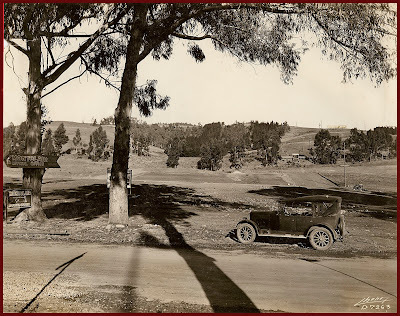 A logging road to the mill was built high up along the side of Dimond Canyon, and later became Park Boulevard. This logging road connected to a wharf at the foot of 13th Avenue and was used to transport the logs down Dimond Canyon to the Bay. By 1860, the San Antonio forest was logged completely. In the first half of the 20th century, the main line of the Sacramento Northern Railroad ran through Montclair. 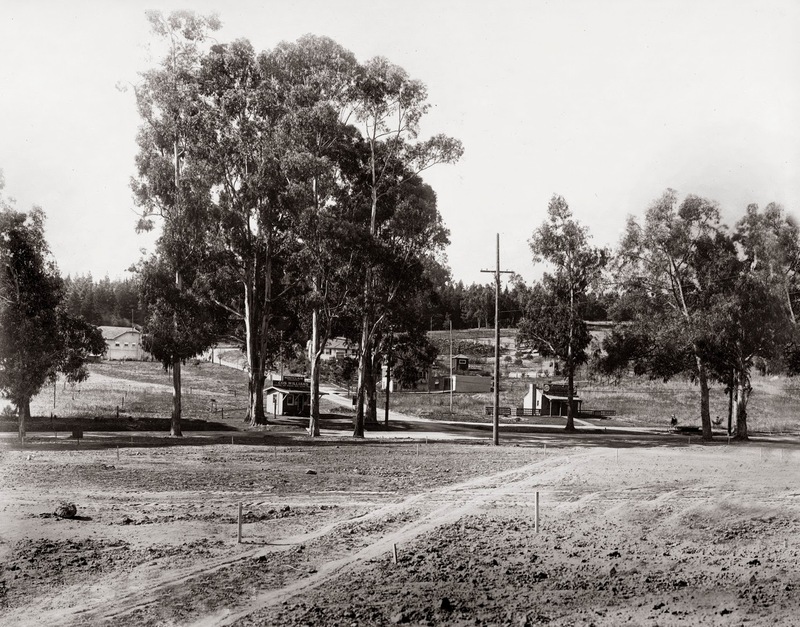 The tracks ran southward from Lake Temescal and crossed into Montclair over a trestle at Moraga Ave. and Thornhill Dr. Thre is now a "pocket park" located at this location in remembrance of this crossing. Then the route ran along a high berm between Montclair Recreation Center and Montclair Elementary School, before crossing Mountain Blvd. and Snake Road via trestle, and continuing up Shepherd Canyon to a tunnel, the west portal of which was located immediately below Saroni Drive. Today, much of the old right-of-way above the village and in Shepherd Canyon is a pedestrian and bicycle path. Although the old railroad trestles throughout Montclair were all removed decades ago, in recent years a pedestrian bridge was built in the same location of one of them, across Snake Road, to connect the two major sections of the pedestrian pathway. The trail was paved as well at the same time. One of the first schools located in Montclair was at the current site of the now-closed Moraga Avenue firehouse, and was named in honor of John Coffee Hays, one of the founders of the city of Oakland. The Hays school was closed in 1913. Though already sparsely populated since the logging days, major residential subdivision of the village and hills began in the 1920s. The 1927  Montclair firehouse was designed in the Hansel and Gretel style  by famed regional architect Julia Morgan, and attributed to her but who actually designed this structure is uncertain at this timed. Following the 1989 Loma Prieta earthquake, the Oakland Fire Department built a new station house on Shepherd Canyon Road, and upon completion, vacated the 1927 structure. According to comments here: "Neither the firehouse nor the library was designed by Julia Morgan. The firehouse was by Eldred E. Edwards of the Oakland Public Works Department. See Wiki on Montclair Firehouse"
I wonder if the observatory picture is of the Chabot observatory, which moved from a downtown location to near Mountain and Leona in 1915. This is not Chabot observatory as far as I know, although perhaps I should forward this to Chabot to see if they know, or have records on their early site development; AS I understand it this is entirely related to the early sales of real estate in the hills - I know the other location on Leona - will post a shot of that soon. I do no believe that this was a "celestial" observatory, but a place for folks to get a better look at the view. There was a similiar "observatory" in Golden Gate Park. The question of where this building was comes up frequently. The best way to figure it out is to "take a hike" (Gene, I believe that's what you love to do; I'd be happy to come along.) We would need to match the skyline in the background up with today's. This may be impossible, however, because of the trees that are there now. By the way, DeeDude is Dennis Evanosky, that's me in a younger man's clothes without my beard. In your posting of the Montclair Observatory and comment about Paul Pause and the Montclair Realty Syndicate, you said there was a house built for Mr. Pause. You weren't sure of the number. We live in the house, and it is 1949 Asilomar Drive. There are two other original houses on our block of Asilomar. When the observatory burned down, Mr. Pause opened his house to visitors to appreciate the view and the merits of building in Montclair. There is a page of the Oakland Tribune, I believe from March 25, 1928, dedicated to the "Montclair Model View Home." It was an all-electric home, an innovation for that time. I believe that the house on Aztec was built after a previous house was designed but never completed. It was to have been of an Asian design and was going to be built for a world traveler. The current side fence of the Aztec home has an oriental feel to its design, but I don't know if it is original. The observatory was definitely not a celestial observatory. We did a fair amount of research on the subject. Apologies Charly - apparently my notifications were not working and I did not see your comment - terrific information! When I scouted this area I found it very difficult - the mature trees made it hard to determine... We will have to check it out again - as we are only slightly up the hill off thorn hill on Evirel.. I thought the house owned by the guy restoring the VW bus and Model T era car was just right of the tower. Did not know it had burned...when did that happen? Hello, My school would take field trips to the Chabot observatory on Mountain Blvd. near HWY 13, 1970 ish. Yes, your first picture is of that location, Mountain Bl. and near Leona Lodge.